WASHINGTON — LeoSat says Spanish satellite operator Hispasat has matched Sky Perfect Jsat’s investment in its low Earth orbit broadband constellation, bringing the company closer to completing its $100 million Series A.
Luxembourg-based LeoSat still has a long way to go in financing its network of 84 high-throughput satellites, which is estimated to cost $3.6 billion, but the support of two of the world’s largest regional satellite operators has buoyed the company as it further refines its constellation. Mark Rigolle, LeoSat’s CEO, told SpaceNews that “everything’s the same” between Hispasat’s investment and the one Japan-based Sky Perfect Jsat made in May 2017. The exact amount was not disclosed for either, but the investments secure the ability resell LeoSat services and grants “privileged access to capacity,” he said. Unlike the constellation programs of SpaceX, OneWeb, and others, LeoSat’s focus is concentrated on high-end customers willing to spend liberally for the guarantee of large amounts of low-latency capacity. Rigolle said those customers, which now represent $1 billion in soft commitments contingent on the constellation’s success, span multiple verticals including government, aviation, and banking. LeoSat intends to raise $1.2 billion in equity, then borrow the remaining $2.4 billion. Rigolle said the export-credit agency BPIFrance will be involved in provisioning the loaned money once the equity is in place. Thales Alenia Space, though lacking a firm manufacturing contract, is working closely with LeoSat on designing the satellites for its constellation. Rigolle said LeoSat is abandoning plans to launch two demonstration satellites next year after completing a meaningful amount of tech-validation on the ground with Thales and Jsat, particularly the onboard processors and inter-satellite links. Rigolle said LeoSat will be able to start global service with 54 satellites, but will only have one visible at any point on the Earth’s surface with that number. Once the company reaches 78 satellites, customers will always be in line of site of two satellites, ensuring virtually uninterrupted service, he said. 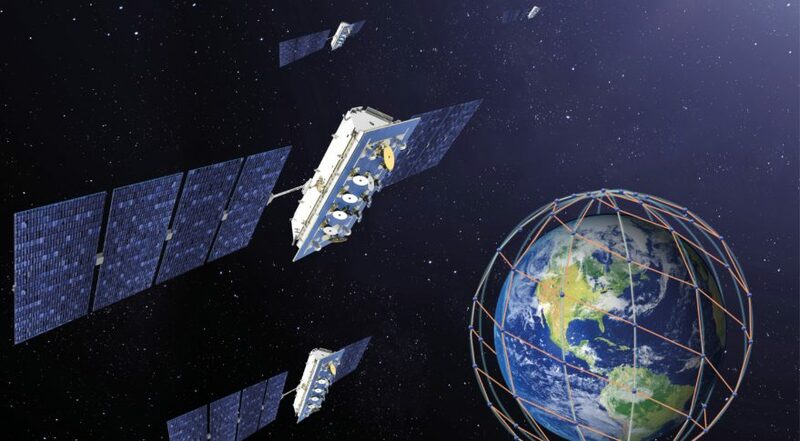 LeoSat plans another six satellites as in-orbit backups — one per orbital plane — and has a filing with the U.S. Federal Communications Commission for up to 108 satellites. Rigolle said LeoSat could scale up to 108 based on customer demand. Launches are projected to occur in 2021 and 2022, he said. Engineers from Hispasat will evaluate LeoSat’s constellation and may provide additional enhancements, Rigolle said. Jsat and Hispasat both view LeoSat as a way for their companies to invest in broadband as satellite operators grapple with how to draw revenue from increasingly important data services. Last year Koichiro Matsufuji, general manager of Jsat’s finance division, said Jsat’s investment in LeoSat was to fend off cannibalization of geostationary data services by higher speed, lower latency LEO broadband. In a July 10 statement, Carlos Espinós, CEO of Hispasat, praised LeoSat as creating infrastructure that can keep up with growing data demands. The regional strengths of both partner operators — Jsat in the Asia Pacific and Hispasat in Europe and Latin America — will support the distribution of LeoSat services, Rigolle said. LeoSat also stands to benefit from Hispasat’s work with flat panel antenna startup Phasor. Since LeoSat and Hispasat are both partners of Phasor, whose antenna is slated for release late this year or early next year, the two companies will combine some of their work, Rigolle said. Jsat’s partnership with Kymeta, whose antennas are already on the market, is of less significance to LeoSat. Rigolle said the throughputs from Kymeta are simply too low for the services LeoSat plans to offer. “We are going to be selling in increments of 100 Mbps, so that solution is not for us,” he said of Kymeta. Rigolle said LeoSat is resetting the goals it had for each funding milestone. Some of the tech-validation work expected to be done after completing a $100 million Series A is now complete before that financial milestone, he said. LeoSat is still seeking to close that Series A, though he didn’t give a time frame. Rigolle said Jsat indicated it would be willing to invest more once LeoSat secured a second strategic investor, which it now has in Hispasat.